The mobile app ecosystem has always been dynamic. The app marketers’ key performance indicators (KPIs) for ad campaigns used to be measured by ad clicks and install volumes. As the industry continues to develop, LTV user acquisitions are now the measurement of campaign performance. So how do we deal with this changing landscape? One of the key solutions is leveraging suppression lists. To determine the value of suppression lists, we analyzed a programmatic advertising campaign for a game app over a period of 40 days. The advertiser wanted to acquire the highest quality users at an optimal CPI. Using the advertiser’s install data, we built suppression lists to not bid on existing users. How do suppression lists work? There are two types of suppression lists: static and dynamic. For a static suppression list, the advertiser sends us a list composed of past user install data which is generally provided as a CSV or DAT file at the onset of the campaign. 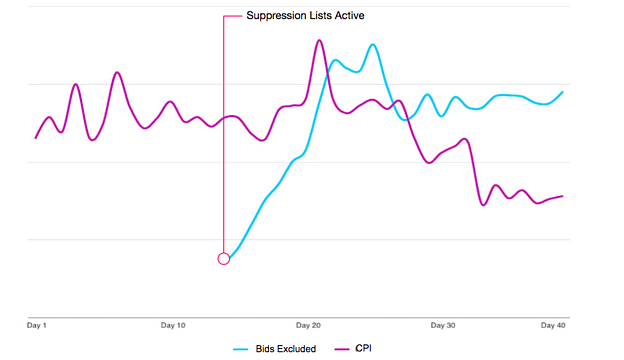 We compare the data in the suppression list with the bid requests in the ad exchanges. If the data matches, we exclude that match and bid on non-matching users to avoid showing the ad to the past users. The other type of suppression list, dynamic, is composed of organic users and users acquired through all other paid marketing activity. When the advertiser through their attribution partner enables the dynamic suppression list, the matching users are excluded from the bid and the users who have already seen the ad through other media are not targeted. During the first 15 days of the campaign, the CPI was high. On the 16th day, we activated the suppression lists and started excluding bids that had a match with the lists. A few days later, a considerable decrease in CPI was noticed. Overall, we maintained the CPI at or below the goal during the campaign period. The results revealed that suppression lists had strong performance on the advertiser’s KPI—lowering the average CPI. This is a proof that Aarki’s machine learning algorithms improve campaign performance across various metrics and ensure that your advertising budget is spent on the right user.